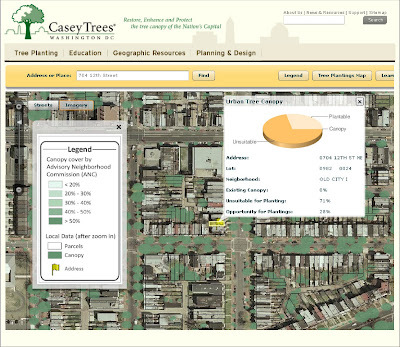 Have you checked out the new Casey Trees Map yet? If not, brace yourself, it's pretty amazing. 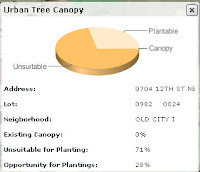 The roll out of the Casey Trees Map accompanied the announcement of Casey Trees Urban Tree Canopy (UTC) Goal of 40 percent by 2035 and features two interfaces - DC UTC and Casey Trees Tree Planting Maps. The DC UTC Map allo ws individuals to determine the existing tree canopy and planting opportunities for any property or place in DC. The sample search above shows that while the majority of the property would not support any trees due to imperviousness (i.e. house blueprint, driveway, etc. ), 28 percent would. By determining your property's planting potential, you can better identify how you can easily play role in re-greening your home, neighborhood and city. The Casey Trees Tree Planting Map allows users to locate all 5,567 trees (and counting) Casey Trees has planted since 2003. You can search by address or place, tree species, and/or event planting name. So give the Casey Trees Map a whirl and let us know what you think. To learn more about the UTG Goal - 40 percent by 2035 - click here.